The Miami Beach EDITION is thrilled to announce its dynamic roster of events taking place at Basement Miami for Miami Art Week 2015. Following one of the most talked about hotel launches, which took place over last yearâ€™s Art Basel, Miamiâ€™s leading nightlife and entertainment venue strikes back better than ever, with a week-long series of events, that kicks off with a 1 year anniversary celebration. To kick off Miami Art Week, conceptual light artist, Olivia Steele, will unveil two light installations made of neon, which will be located in the ice skating rink and â€˜Larry Loungeâ€™ of the club, and remain as permanent installations. 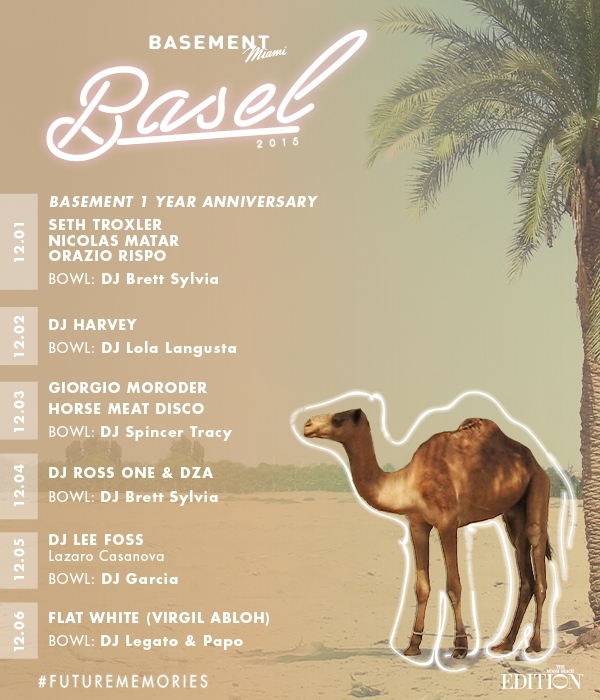 From Tuesday through Sunday, Basement Miami will be stacked with a lineup of cutting edge international DJs, such as disco legend Giorgio Moroder, Seth Troxler, DJ Harvey, and Kanye Westâ€™s creative director, Virgil Abloh, along with local favorites, DJ Ross One and DZA. With parties hosted by Paper Magazine and Whitewall Magazine, and art collaborations with Material Art Fair and Anonymous Gallery, Basement Miamiâ€™s events will feature prime talent and the best crowds, all complemented by state of the art sound and lighting systems.